CAO Cigars is entering a new era, and we wanted to find out what that new era would bring for the brand’s many fans. In 2007, the family-owned company was purchased by the Scandanavian Tobacco Group (STG). Later, in early 2010, STG merged its premium tobacco division with General Cigar (maker of Macanudo, La Gloria Cubana, Punch, Hoyo de Monterrey, and many more well-known lines). Since then, a number of CAO stalwarts have left the company, including President Tim Ozgener, Chairman Gary Hyams, and Lifestyle Director Jon Huber, and CAO left Nashville to join General Cigar at its headquarters in Richmond, Virginia. To get the scoop on what all this means for those who smoke and enjoy CAO Cigars, I talked to Ed McKenna, senior brand manager for CAO. Stogie Guys: What is your background in cigars? How long have you been smoking, and do you remember the first cigar you really enjoyed? Ed McKenna: I joined General Cigar several years ago, after being on the marketing team for Bacardi’s tequila portfolio. The premium cigar business shares many similarities to the world of spirits, but as I quickly learned, this industry is its own universe and to this point, I haven’t been able to compare it to any other. Since I’ve been with General Cigar, my focus has been on Punch, Hoyo de Monterrey, and Excalibur cigars. Together with Rick Chandler (director of Villazon brands at GC), with the product development team at HATSA (our factory in Honduras), and with input from our consumer ambassadors, I’ve launched Upper Cut by Punch, Reposado en Cedros, and Rare Corojo 10th Anniversary. I’m now managing the CAO business full time. I have always liked cigars. My Dad was a casual cigar smoker, and I got bitten by the bug as they say, way back in college when my friends and would go over to our local tobacconist (then, it was Tobacco Village in Delaware), and pick up a few smokes to enjoy during the weekend. Those were great times. The first cigars I remember smoking were Partagas (my father’s favorite), Macanudo, and Onyx (random, I know). I smoked cigars regularly in college, but there’s one standout occasion with Partagas. That was with my dad. We celebrated my college graduation over a robusto, and I remember thinking that I’d remember that cigar for the rest of my life. Along with a Punch Rare Corojo at my wedding last year, that Partagas cigar will go down in history as one of my favorite smokes. Outside of enjoying cigars at work, I still smoke cigars with my buddies and always light up during special occasions. Either way, you’ll usually see me with a CAO La Traviata, or a Punch. I also smoke competitor’s products, so I have a keen knowledge of what’s out there on the market. I love 50-54 ring gauge smokes. I don’t like a cigar usually that’s more than 5.5 inches in length. For me, robustos are the best at bringing out the flavor of a cigar. When I first came on board at GCC, I toured the Boston area with Mark Lagace (the GC sales rep for Massachusetts), and he introduced me to the Punch Rare Corojo El Doble (we had a three-hour drive to the Mohegan Sun, so a big cigar seemed appropriate). Wow, what a cigar. I’d had my first trip planned to HATSA at that time, but that fact that Mark went to great lengths to explain to me the nuances of that cigar, the wrapper/binder/filler and how they interact, and really how to enjoy a great smoke, that helped prepare me for seeing the inner workings of the factory and gave me a firsthand understanding of the passion that people in our business have for the product. On that same trip, I participated in my first “NERF” (New England Herf), and it was then that I realized I was joining a fraternity of sorts. Cigars connect all types of people, sparking conversations between guys (and girls) who might not ever have reason to speak to each other. To me, the camaraderie that comes with enjoying a cigar is what makes this business so unique and so much fun. SG: CAO has always had loyal fans, but many are anxious about the new corporate structure and what it means for the blends they’ve enjoyed over the years, especially when they hear about production of some lines switching factories. How can you reassure them that their favorite blends won’t be changing? EM: This has been the question I’ve gotten more than any other, and I’m not sure how else to reassure people about the fact that we have not, or will not, change any of the CAO blends, nor have we changed the way we handcraft CAO cigars. Look at it this way: We have a dedicated fan base of consumers who love the product and we would never want to jeopardize that. Why would we even think of changing anything? Ultimately the proof is in the pudding: There is no difference in taste between the cigars that were made before we took over the brand to the cigars we are bringing to market now. Still, I recognize that change can bring uncertainty, so that’s why I am getting out there, talking to media and to bloggers such as yourself about CAO. When we took over the brand, we never intended to change the products and we remain committed to that. Our focus continues to be on bringing CAO to the consumers that made the brands popular, maintaining CAO’s tradition of bringing new, innovative products and packaging to market, supporting the brand with marketing platforms, and promoting distribution through our dedicated sales force. There have been a couple of brands, including Brazilia, Italia, and Mx2, which we were producing in Nicaragua and now are making in Honduras. HATSA is one of the oldest factories in Honduras, with a tradition of cigar making that spans more than 30 years. If consumers see any changes at all in our products, it will be in improved quality. The reputation for producing high quality products is why HATSA continues to be one of the most respected cigar factories in the world. SG: What advantages do you see for the brand, both for current lines and future, to bringing CAO fully under the General Cigar umbrella? EM: Operationally, we have carved out CAO as a separate business unit, that enjoys the benefits of the larger company overall. The brand has great opportunities. First, and foremost, with the existing CAO portfolio, we are able to utilize our decades of experience in cigar making and quality assurance to bring the best, most well-constructed, consistent-tasting cigars to the consumer. We are also uniquely positioned to utilize our dedicated sales team to partner with our retailers by bringing innovative programs to them, and to continue to generate interest in our core offerings. Further to this point, we have the largest sales force in the premium cigar category and will bring CAO products to more retailers and consumers than ever before. New product development is a huge advantage for CAO, now that we have the brand. We are able to utilize our vast library of tobacco inventory and processing expertise, and we can call on some of the true masters of the industry, with decades of expertise to create unique blends and packaging. In addition, we are still working with the same people at the CAO factory in Nicaragua, and have also brought in some new talent to bring fresh ideas and unique tastes to new products. Rick Rodriguez, the director of new product development for CAO, is leading the charge on new products. 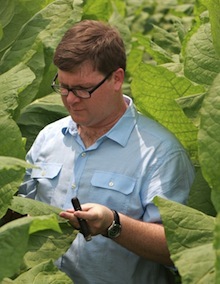 Rick is a guy who was handpicked many years ago to be mentored by our cigar masters. Not only has Rick studied in the Dominican, Honduras, and Nicaragua under industry legends such as Benji Menendez and Daniel Nuñez, but he also developed blockbuster new brands while working on the La Gloria Cubana business. Having been a sales manager for General Cigar before he was chosen to become a cigar master in training, Rick has his finger on the pulse of what consumers want in a cigar and, together with the CAO team in Nicaragua, I am confident that we will make a lot more noise with CAO very soon. Ed McKenna (left) and Rick Rodriguez (right) examine tobacco in a curing barn. SG: People had a strong attachment not only to CAO’s cigars, but to the people they associated with CAO like the Ozgeners and Jon Huber. What plans do you have to keep a personal connection between CAO smokers and the people behind the brand? EM: Now that the integration is complete, and considering that our new product development plans are firmly in place, I am taking it to the streets, so to say, to talk openly with media and with bloggers about our plans for the brand. We’re picking up on the social aspect of the brand by using Twitter, Facebook, and the CAO website to keep our loyal consumers apprised of what’s going on with the brand. We’re also launching our own take on “CAO All Access,” on CAO.com. This will allow us to provide detailed information on what’s going on behind the scenes with the brand. With this platform, we have more space to communicate than we do with Twitter and Facebook. Across all of these communication channels, you’ll hear from me and from Rick about what’s going on with the brand. We’re going to bring it to life even more than before with photos and videos, and we hope that dedicated CAO fans will enjoy the opportunity to be closer to the brand than ever before. SG: There are a lot of lines under the CAO name. Are there any plans to discontinue any CAO blends or otherwise change the existing lineup? Will any of the lines (or have they already) become exclusive cigars for one retailer? EM: To be clear, General Cigar has not discontinued any CAO lines. Vision was discontinued at the end of last year, and much of the remaining product did go to Famous. Karmasutra Splash was another line that was discontinued at the end of last year. These were decisions taken by CAO before we took over the brand. Sopranos is absolutely still in production, and it’s very popular. Even though the show ended a long time ago, I’m amazed at how many people stop me at events or at retail to profess their love for that brand. SG: In past years CAO often made a splash at the trade show with a hot new release. What do you have planned for this year? EM: Rick has been working with the factories and our new product development team to create a new collection which we’ll debut at IPCPR. This product features a special Honduran wrapper that we love. Unfortunately, I can’t say much else for now, other than that we will be at IPCPR with what we feel is a great new product, one that also pays homage to CAO’s tradition of packaging innovation. SG: Besides cigars under the General/STG umbrella, what cigars are you a fan of? What beverage is your favorite to pair up with a cigar? EM: Outside of our portfolio, I enjoy the Liga Privada as well as an occasional Padrón. I also try to sample all of the new stuff out there. So when I’m home, I pop into Havana Connections here in Richmond and when I’m on the road, I visit our customers across the country and sample cigars from our competitors. I love pairing up a cigar with water or coffee here in the office, but after hours, nothing beats a cigar with a nice Jameson on the rocks. Many thanks to Ed for taking the time to answer our questions. As we have since 2008, StogieGuys.com will be at the IPCPR trade show next month where we will report all the details on the latest from CAO, General Cigar, and the many other companies releasing new cigars at the trade show. I had my worries about this guy (can we call him the new Huber?) until I read he's a Jameson drinker… that gives me confidence in his judgement and taste. What about the buzz on a CAO price increase? ROTHNH — the only price increase is at CI. CAO and General have not issued any release on increasing the price. I appreciate your interview with this guy, I've been wondering what's going to happen with the brand. I don't smoke many CAO's but I feel they always delivered quality. I swear they've done something with the La Traviata, they don't taste as good and the wrappers are not as oily. It might be in my head, but they just look and taste dry now. In my experience, the blends and wrapper HAVE changed. And, unfortunately, not for the better. I've been smoking CAO cigars exclusively for more than 10 years and the Brazilia (Amazon) is – or shall I say was – my favorite. The wrapper has changed distinctly. It's no longer the lucious, oily type of old. The binder/filler blend has also changed. The finish is less spicy and more harsh. But my biggest gripe is the construction of the cigar. My last couple of boxes were so loosely packed that they burned much hotter and came apart before finishing the cigar. This is the first time in many years that I will sadly be switching brands… I miss the real CAO terribly.